Friday night March 15th at 7:00pm join Clyde, Niki and Jackie at the Venice Performing Arts Center for a Power-Point presentation on their Journey to Spain to photographic Dali’s home town. Then on Saturday meet Clyde and his Venice Gallery to view all of the photographs from the Dali exhibit and enjoy a darkroom tour. 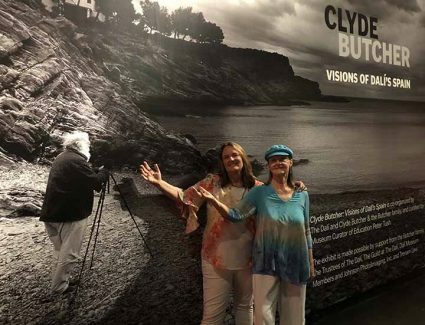 Purchase Tickets click here Clyde Captures the Landscapes of Salvador Dali’s Life in a Collaboration Across Time. For Salvador Dalí, the landscape of his homeland was always an essential feature of his work and outlook on life. Nearly two years ago, The Dalí Museum sought out Butcher to use his talents to capture a body of images of Dalí’s Mediterranean home, featuring some of the world’s most dramatic landscapes. Butcher traveled to the village of Cadaqués, where Dalí spent summers while growing up, Dalí’s house in Port Lligat and the rugged region of Cap de Creus – all areas that are prominently featured in Dalí’s works. The thoughtfully curated collection will feature photographs that take viewers on a journey through the Catalonian region, with images ranging from an intimate 2 feet to a panoramic 8 feet.